So maybe there's some event I could use to deserialize output only when Task.Run finishes? How do I go about it? @robs23 - I wonder if something is being left behind from a previous build. I know rebuild all should clean up stuff in the build environment, but just in case, can you delete your obj and bin folders. Uninstall your app from the Android device. If you are using the shared runtime (in Packaging Properties for the Android project), go onto your Android device and remove the Mono shared runtime. After that, try a rebuild to see if the problem still exists. If it does, it might be worth checking your NuGet packages (particularly the HTTP ones, but everything else too whilst at it) to ensure you haven't got multiple versions of any package. Where exactly do you call your async Task? Normally you would await it and handle the result then. If you call it on your constructor you'll have to think about another way. Maybe load your data on the OnAppearing() Method which you can override and make it async. Option #2: inside the async block. When you said "I thought that maybe I could put it within the call, but it doesn't work", what does "it doesn't work" mean - what happens and what do you expect to happen? It's possible that you might need to explicitly make work happen on a particular thread, but cannot be sure without more detail. @robs23 - As your app grows, you will want to restructure your existing code. For each type of page in your app, create a class that inherits from ContentPage. Move the code that builds the UI for each page into the constructor or OnAppearing method of your page-specific class. So, in your code above, this means moving the StackLayout, Picker, Title and Content code. Depending on what ReloadUsers does, you may need to use Device.BeginInvokeOnMainThread (Google this for many, many examples). Avoid doing async UI work in OnStart - doing async UI work there creates a race condition. I've not seen a problem as a result on Android or iOS, but it can cause a problem on UWP (I raised a bug report for this a while back). Only load your data where you need them. So create your mainpage in visual studio -> New Item -> Content Page and set this as your MainPage. I was able to rebuild the app without any error. I've deployed it to my phone and ran it, the UI looks like before but the app crashes after 1-2 seconds. Could you have a look at my OnAppearing() event? Is there something obviously wrong? Can I place some MessageBox type event in OnAppearing() to display e.g. keeper.Users.Count.ToString() ? @robs23 - It would help to know what exception is being thrown and why. Change your "catch" to "catch (Exception ex)" and output (either via DisplayAlert or System.Diagnostics.Debug.WriteLine) ex.ToString(). Seems you got some error when Deserializing. Like @JohnHardman said change your catch and tell us the error. InnerMessage.Message:Constructor on type 'System.Net.Http.HttpClient' not found. Hopefully they tell you more than they are telling me..
@JohnHardman - Thanks. I'm not sure if you meant main forms project's references or droid project's references, so I'm attaching screenshot of both. 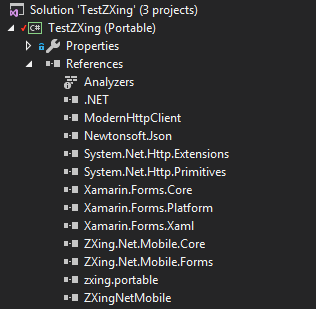 From the references you mentioned, I can see forms project is missing System.Net.Http (but it has both System.Net.Http.Extensions and System.Net.Http.Primitives). Should I add System.Net.Http then? As to linking - I understand I should set Linking in Linker properties of my droid project to "none", right? Currently they're set to "SDK and User Assemblies"
There's no harm in doing so. Yes, set it to none to help identify the problem. This is the most likely cause. Having checked in NuGet and System.Net.Http is installed for all 3 projects (forms, droid, iOS). I set Linking to none, rebuilt the solutions (no errors) and ran - same error as before with same details. I deleted everything from solution's packages folder and projects' bin and obj folders. Checked if I was using shared runtime but I wasn't. I rebuilt the app, no errors. Archived android project and deployed to the phone. Installed it and ran it without much faith in success and bang everything works as expected! Now I don't know what made it work - setting Linking to None or deleting garbage from bin & obj.. What I noticed, though, it's 4 times bigger weight of the APK. I guess it's must be because of Linking = None as this is what really changed from previous built. I think it should get back to normal size when I set it back to Linking = SDK and user assemblies, right? Anyway, thank you for walking me through here, I definitely appreciate this! And for future I must remember to clear bin and obj before each building, it's been 2nd time old bins got me into trouble with Xamarin..